I have a confession to make. I'm NOT the best person when it comes to remembering birthdays. I can tell you the month and often even the week, but exact dates are forever escaping my memory. Even my own husband has heard me ask him on multiple occasions, "Your birthday is the 5th, right? Or is it the 4th?" If you're anything like me, I can tell you that the quickest way to get out of any trouble caused by a forgotten date is to keep a foolproof cake recipe in your back pocket. Something that is as delicious to eat, as it is beautiful to look at, and ridiculously easy to make. The object of the game is simple ingredients + major nostalgic flavor. When the folks at McCormick asked me to share a favorite birthday treat recipe with you to celebrate their 125th birthday, I knew it was time to write about this cake. 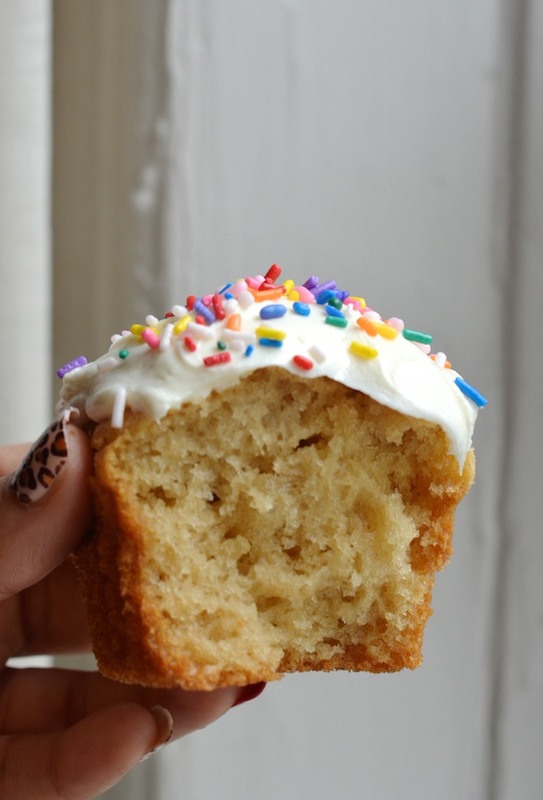 Meet my Vanilla & Brown Sugar Mayo Cupcakes! This year, in honor of their 125th birthday, McCormick released a brand new pure vanilla extract called Extra Rich Pure Vanilla Extract. This new version is 25% stronger than regular vanilla extract, with an awesome balance between sweet caramel and bourbon-rummy flavors. 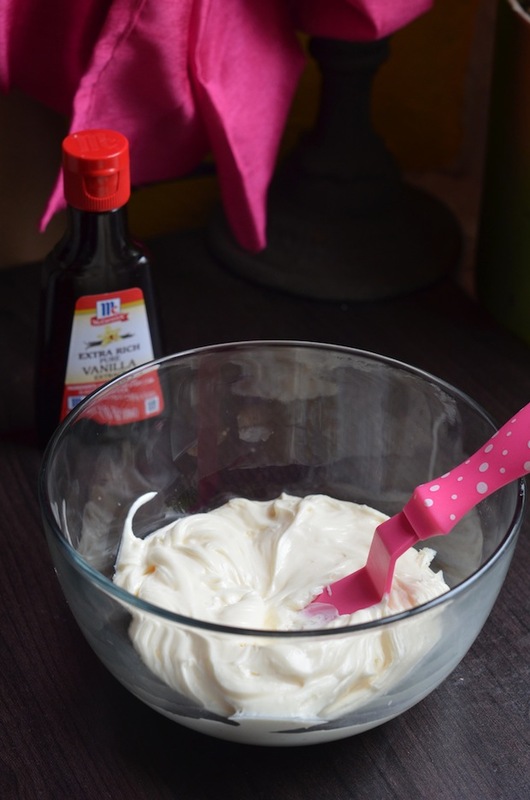 I've always been the kind of girl who sloshes in a little extra vanilla when baking since I love it so much, so I feel like this extract was basically made for me, and I really love how incredible it is in my mayonnaise cake. If you've never tried (or even heard!) of mayonnaise cakes, they are an old-fashioned kind of cake that dates back to World War II, when things like eggs and butter were rationed. The mayonnaise--which is made from eggs and oil--would take the place of the missing eggs and butter, producing a cake that is light, fluffy and incredibly moist. And don't worry--there is absolutely NO mayonnaise flavor in the cake itself--just rich, fragrant vanilla, reminiscent of all my favorite birthday cakes as a little girl. They're also one-bowl cakes, which means you simply whisk together the dry ingredients, then pour in the wet ones, and mix it all together. A quick stint in the oven, and it won't be long before you and your family are enjoying sweet, classic vanilla cupcakes. As part of their year-long birthday celebration, McCormick is inviting everyone to visit their site, Flavoroftogether.com to share their favorite flavor stories and memories, and discover new recipes and videos. Hop on over to share about your favorite birthday cake; for each story that is shared, McCormick will be donating $1, up to $1.25 million to the United Way to help feed those in need. Mayo takes the place of eggs and oil in this easy one-bowl recipe, producing a cake that is light, moist, and rich with real vanilla flavor. Preheat oven to 350 degrees, and line a 12-cup cupcake pan with paper liners. Whisk together the flour, sugars, baking powder, baking soda, and salt. Add the whole milk, mayonnaise, and vanilla, and beat well with an electric mixer until smooth (about 1 minute). Divide evenly into prepared cupcake tins (about 3/4 of the way full each) and bake for 17 to 20 minutes, or until puffed and slightly golden. 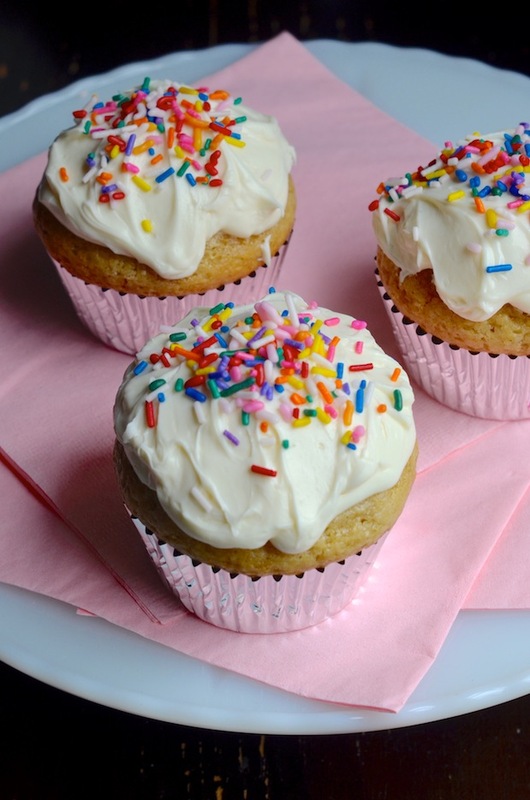 Remove cupcakes from pan, and let cool completely on a rack before frosting. Beat together the softened cream cheese, butter, and vanilla until light and fluffy. Add the sifted confectioner's sugar, and beat until smooth.